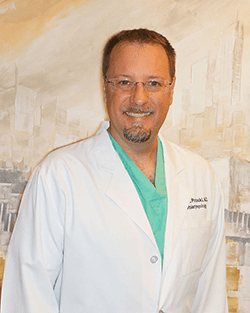 Dr. Potocki graduated from Baylor University in 1990. He received his medical degree from Texas Tech University Health Sciences Center in 1994. After completing his Otolaryngology Residency, he and his family came to Lubbock to join Dr. Thomas F. Neal. They practiced together until Dr. Neal’s retirement in the fall of 2013. Dr. Potocki met his wife in college and they have been married since 1990. They have 3 children. He enjoys his family, church, and watching his kids’ sports as well as Texas Tech sports. He likes travel, both for leisure, and to participate in medical mission work with his family. Dr. Potocki chose the Ear, Nose, and Throat specialty early in his training. He quickly became interested in the complexity of the anatomy and function of that part of the body. He finds the variety of ENT practice to be satisfying, including the ability to help people of all ages. Quickly relieving a child’s ear infections with tubes, or lessening sore throats by tonsillectomy is rewarding. Improving quality of life for patients by helping with voice disorders, dizziness, and sinusitis also makes his work enriching. He has been excited to incorporate recent advances in sinus surgery by adding balloon sinuplasty to his practice. This has allowed more patients to be treated in the office with less discomfort and a shorter recovery period compared with other sinus surgery techniques that require general anesthesia. "A BIG 'Thank You' to Dr. Potocki and staff..."
I would like to start by saying a BIG thank you to Dr. Potocki and his wonderful staff. They make you feel at home and very professional. My surgery went fantastic and they made sure you were comfortable and felt at ease all times.